Compounds we perceive as sweet or bitter in the mouth trigger similar receptors and signaling pathways elsewhere in the body, helping to regulate digestion, respiration, and other systems. In the choice of what to ingest, the sense of taste is both a guardian and a guide. The sensations of bitter and sour keep us from eating potentially toxic substances and strong acids, while the preferred qualities of sweet, umami (the “savory” taste of glutamate), and salty drive intake of carbohydrates, amino acids, and sodium, respectively. Taste sensations are mediated by taste buds—small clusters of specialized epithelial cells on the tongue, soft palate, and larynx. Over the last two decades, as scientists have uncovered the array of G protein–coupled receptor (GPCR) cascades and ion channels that underlie taste signaling, they have also discovered, to their surprise, that the expression of these receptors and channels is not limited to taste buds. Indeed, elements of the taste transduction cascade occur in many chemoresponsive epithelial cells scattered throughout the stomach, the intestines, and even the airways. 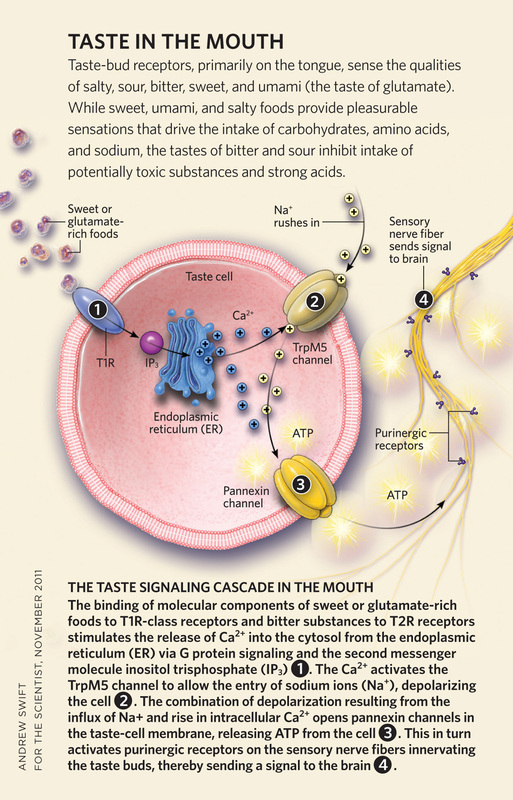 Despite the similarities in receptor molecules and signaling cascades, however, only the chemoreceptive systems in the mouth evoke a sensation of taste. The others, researchers are learning, serve different functions depending on their location. The sensations of taste are divisible into five distinct qualities: salty, sour, bitter, sweet, and umami. Salty and sour sensory perceptions rely on ion channels, which are expressed in a variety of tissues, such as kidney, as well as in taste buds. Bitter, sweet, and umami qualities rely predominantly on two distinct families of GPCRs, Tas1R and Tas2R (T1R and T2R), first identified in taste tissues in 1999, but subsequently identified in other tissues, including gut and airway epithelia. Despite the difference in the qualities detected by the two families of taste receptors, both utilize similar, if not identical, downstream signaling effectors, including the taste receptor-associated G protein a-gustducin, one of the first identified proteins of a GPCR taste transduction cascade. In 1996, researchers at the University of Würzburg reported that a-gustducin is expressed by brush cells of the stomach and intestine.[1. D. Höfer et al., “Taste receptor-like cells in the rat gut identified by expression of alpha-gustducin,” PNAS, 93:6631-34, 1996.] Brush cells are tall, columnar epithelial cells that display a distinctive tuft of stiff microvilli at their apex. Based on morphological features, researchers had suspected that these cells were chemosensory, but the findings of gustducin, taste receptors,[2. S.V. Wu et al., “Expression of bitter taste receptors of the T2R family in the gastrointestinal tract and enteroendocrine STC-1 cells,” PNAS, 99:2392-97, 2002.] and the ion channel TrpM5, another taste transduction element,[3. S. Kaske et al., “TRPM5, a taste-signaling transient receptor potential ion-channel, is a ubiquitous signaling component in chemosensory cells,” BMC Neurosci, 8:49, 2007.] 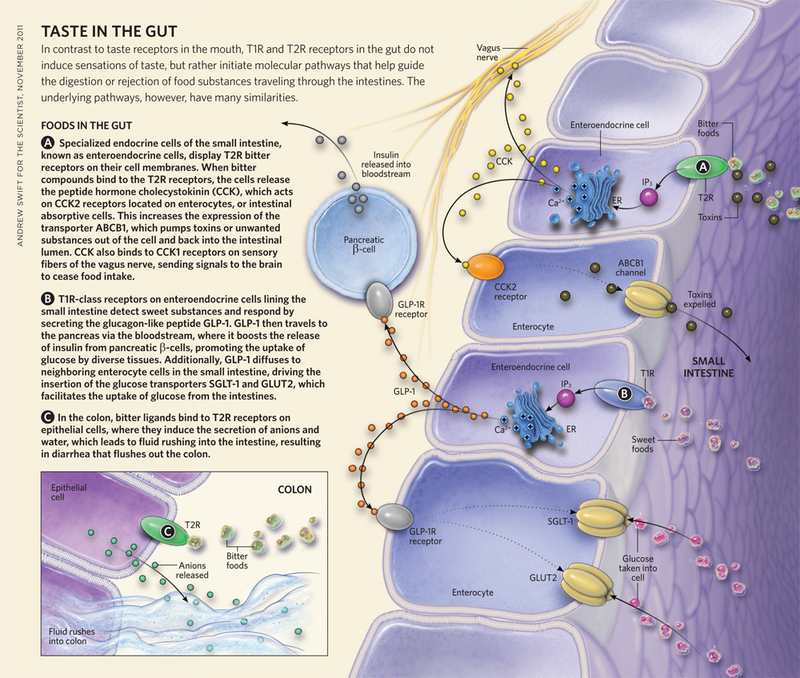 confirmed this early speculation, and suggested that brush cells detect nutrients in the gut. In the last 15 years, researchers have uncovered more and more taste cascade elements throughout the digestive tract, and even in the airways, suggesting a widespread distribution of complete taste transduction cascades—from taste receptor to transduction channel. 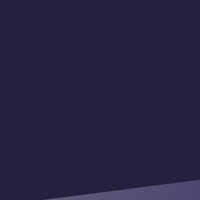 Indeed, for every taste transduction cascade discovered outside the oral cavity, researchers seek to uncover the functional significance of the chemoresponsive cells in those areas. Taken together, the findings suggest that the taste transduction cascade is not restricted to the sensation of taste per se, or even to systems regulating food intake. In fact, the receptors mediating taste transduction appear to have evolved early in the vertebrate lineage, and to have since been widely adopted as a chemodetection system in a variety of organ systems. One possibility is that the CCK-secreting enteroendocrine cells are involved in a local epithelial signaling system that reduces transfer of toxic substances from gut into circulation. 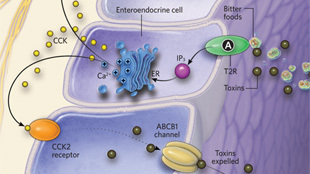 The CCK released from T2R-expressing enteroendocrine cells in response to stimulation by some bitter-tasting ligands may act on CCK2 receptors located on nearby intestinal epithelial cells, called enterocytes, which regulate the absorption of molecules from the intestinal lumen into the bloodstream.[9. T.I. Jeon et al., “Gut bitter taste receptor signaling induces ABCB1 through a mechanism involving CCK,” Biochem J, 438:33-37, 2011.] In vitro studies show that activating CCK2 receptors on these cells increases expression of the transporter ABCB1, which pumps out toxins or unwanted substances from the cytoplasm, allowing the toxins to be excreted rather than absorbed into the blood. Thus, activation of T2R signaling in the intestines indirectly results in increased elimination of absorbed toxins from gut epithelium before the toxins can enter circulation. Lower in the gut, activation of T2R receptors similarly appears to combat toxins, though via a different mechanism. When some bitter-tasting ligands bind to epithelial cells in the colon, they induce the secretion of anions, which leads to fluid secretion into the intestine.[10. I. Kaji et al. “Secretory effects of a luminal bitter tastant and expressions of bitter taste receptors, T2Rs, in the human and rat large intestine,” Am J Physiol Gastrointest Liver Physiol, 296:G971-81, 2009.] This induced efflux of fluids is likely to flush out any noxious irritant from the colon, resulting in diarrhea. 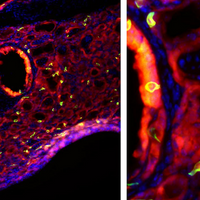 Three years after taste-related signaling components were discovered in the gut, Zancanaro and colleagues at the University of Verona described the presence of gustducin-expressing cells in the airway. Specifically, the researchers examined mice and identified gustducin-expressing cells scattered in the epithelium lining the incoming ducts of the vomeronasal organ, a specialized part of the olfactory system found in many vertebrates, but not in adult humans. Such cells were also identified in the nasal respiratory epithelium. 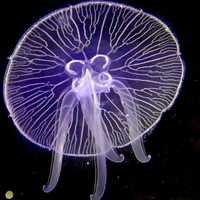 The morphology of these cells is similar to chemosensory cells scattered within the epidermis of fishes, first described by Mary Whitear in the 1970s. In a series of elegant ultrastructural studies, she identified a distinctive type of epithelial cell that extends through the height of the epithelium with microvillous extensions at its apical end. Since these cells also form extensive synapses at their base with local nerve fibers, Whitear suggested they must be a sensory cell type. Furthermore, since the apical specializations were not rigid, she deduced that the cells could not be mechanosensory, and therefore were likely chemosensory elements. Later, two physiological studies on fish with specialized appendages rich in solitary chemosensory cells confirmed the chemoresponsiveness of this system, although the identity of the natural stimulus remains controversial. Subsequently, we and others showed that morphologically and molecularly similar solitary chemosensory cells (SCCs) are present throughout the upper respiratory systems of alligators, mice, and rats; and in the rodents, the cells express the entire panoply of taste-related signaling molecules, including T2R receptors, gustducin, PLCb2, and the transduction channel TrpM5.3,[11. T. E. Finger et al., “Solitary chemoreceptor cells in the nasal cavity serve as sentinels of respiration,” PNAS, 100:8981-86, 2003.] In 2003, we confirmed that the taste signaling cascade is necessary for activation of the SCCs of the nasal cavity.11 These SCCs synapse onto polymodal pain fibers of the trigeminal nerve, which produce a sensation of irritation and pain when activated. In addition, activation of these fibers evokes protective airway reflexes such as apnea (to prevent further inhalation) and sneezing (to remove the irritant). Thus, inhalation of a toxin that activates T2R receptors will be irritating and will provoke changes in respiration,[12. M. Tizzano et al., “Nasal chemosensory cells use bitter taste signaling to detect irritants and bacterial signals,” PNAS, 107:3210-15, 2010.] but will not, of course, produce the sensation of a bitter taste. More recently, we showed that even some bacterial metabolites and signal molecules can activate the nasal SCCs and the trigeminal nerve.12 Upon activation, the trigeminal nerve fibers not only transmit the information towards the brain, but also release peptide modulators (such as substance P and calcitonin gene-related peptide) into the local tissue, including around nearby blood vessels. These modulators bind to receptors on mast cells and blood vessels, causing a local, neurally mediated inflammation of the airway lining. 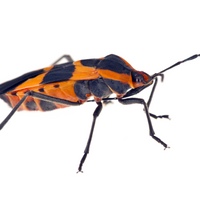 In this way, SCCs not only act as sentinels warning against inhalation of irritants, but also serve as guardians capable of activating the innate immune system to respond to the presence of potentially damaging toxins or pathogens. 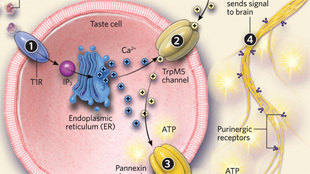 In all of the examples described so far, the taste signaling cascade is used to detect molecules in the lumen of an organ (oral cavity, gut, respiratory passages), and to generate an intracellular cascade to effect release of a neurotransmitter or hormone to signal to other cells in the body. Two recent reports on the expression of taste receptors in the airways indicate that taste-receptor signaling may directly affect the function of the cell that actually detects the stimulus (i.e., a cell-autonomous effect). Last year, Deshpande and colleagues reported that human airway smooth muscle cells express T2R (bitter) taste receptors along with a-gustducin and some components of the taste-associated phospholipase C (PLC) arm of the signaling cascade.[13. D.A. Deshpande et al., “Bitter taste receptors on airway smooth muscle bronchodilate by localized calcium signaling and reverse obstruction,” Nat Med, 16:1299-304, 2010.] Application of various bitter-tasting substances to cultured human airway smooth muscle cells shows the same PLC-dependent increases in intracellular Ca2+ typical of taste cells or solitary chemosensory cells. Surprisingly, however, these increases in intracellular Ca2+ caused relaxation, rather than contraction, of the muscle cells. This paradoxical effect is attributed to the proximity of the T2R receptor complex to calcium-activated potassium channels (BKCa channels), which open in response to increased intracellular Ca2+, causing the hyperpolarization and subsequent relaxation of the muscle cells. In contrast, in taste cells of the mouth and solitary chemosensory cells of the upper airways, the increase in intracellular Ca2+ as a result of T2R activation triggers the transduction channel TrpM5 to depolarize the cell and evoke transmitter release to stimulate other cells. Thus, in different signaling contexts, activation of the same receptor can produce opposite cellular-level effects. However, two recent letters to the editor call Deshpande’s results into question, so the resolution of this remains controversial. T2R activation has also been reported to have a cell-autonomous effect in ciliated cells of human lower airways.[14. A. S. Shah et al., “Motile cilia of human airway epithelia are chemosensory,” Science, 325:1131-34, 2009.] Cultured human airway epithelium expresses some T2Rs along with associated downstream elements. Curiously, these are the first cells with motile cilia known to express sensory signaling elements. 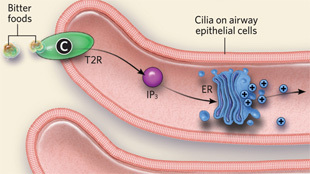 In these cells, the T2Rs are present on the cilia, while PLCb2 is associated with the cell membrane where the cilia insert into the cell body. Binding of the T2R receptor by a bitter ligand initiates a transduction cascade to activate PLCb2 at the base of the cilium, generating a Ca2+ response. The resulting T2R-mediated increase in intracellular Ca2+ causes an increase in ciliary beat frequency, which the researchers suggest could serve to sweep irritants away from the surface of the cell. But while T2Rs can be detected in cultured human airway cells, they are not detected in the lower airways of mice.12 Whether this represents a species difference or the difference between in vivo and in vitro states remains to be determined. It is evident that taste receptors and their associated downstream signaling components are widely dispersed in diverse organ systems, and in many cases serve to help with digestion or to protect cells from potential toxins. But taste receptors have also been identified in other organs and tissues, such as the bile ducts, where their functions are still unclear. The composition of the fluid in the bile ducts is dictated by secretions of the pancreas, liver, and gall bladder. Why should it be necessary to diligently monitor the composition of biliary fluids as they move from gall bladder to intestine? Similarly enigmatic are the reported effects of T2R (bitter receptor) agonists on contractile elements of both the airway and the gut. In the trachea, T2R agonists cause muscle relaxation (see above), but it is not clear how a bitter substance would have access to the smooth muscle cells of the trachea under normal conditions. The smooth muscle of the trachea is buried beneath a relatively tight airway epithelium, and so it seems unlikely that an inhaled bitter substance would penetrate the epithelium to access T2R receptors on the muscle. Similarly, the inhibition of smooth muscle contractility by T2R agonists in the stomach is not mediated by any of the peptides released by dispersed endocrine (enteroendocrine) cells of the gut, and may not even be mediated by T2R receptors. These and other nonspecific effects of bitter ligands emphasize the need to utilize either well-defined pharmacological agents or, better still, knockout animals to establish the specificity of receptors and transduction pathways and the consequences of their activation. Though they may not be for tasting per se, the taste-family receptors are surely doing something to affect the physiology of the organs in which they reside. Thomas E. Finger is a professor of Cellular & Developmental Biology at the University of Colorado Medical School and codirector of the Rocky Mountain Taste & Smell Center. Sue C. Kinnamon is a professor of Otolaryngology at the University of Colorado Medical School and a core director of the Rocky Mountain Taste & Smell Center. This article is adapted from a review in F1000 Biology Reports, DOI: 10.3410/B3-20 (open access).